Hate the pesky feeling of having sand stuck in your shoes? 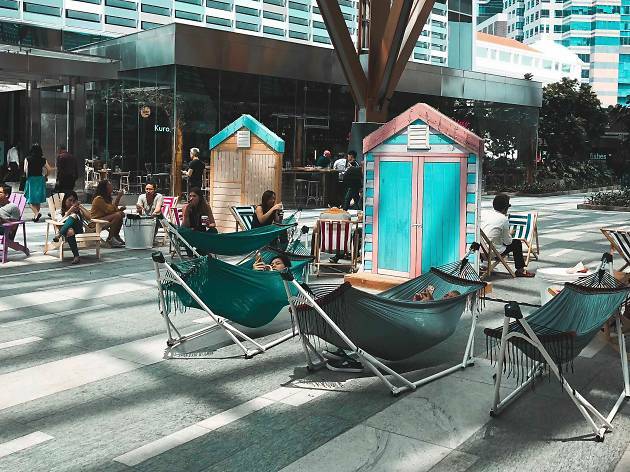 Summer Breeze and Festive Sparkle is a tropical fiesta set in the sand-free landscape of Tanjong Pagar Centre’s Urban Park. 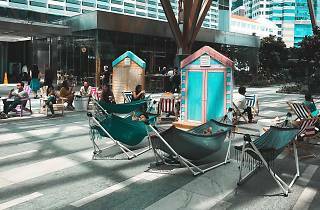 Skip the SPF and stay in the shade at this urban beach paradise from November 17 to December 25. What’s a beach party without a cool drink in hand? A Tiki Fruit Bar will be shaking up refreshing fruit juices on the weekends. Laze in one of the comfy beach chairs and vibrant huts, and wind down to some live band music. Kids (four to eight years old) will have a blast with the bouncy castle. On November 25 and December 16, sign your kids up for the Styling a Sunhat Workshop (noon-2pm) and the Paper Jellyfish Workshop (6pm-8pm).